It may seem like a cultural anomaly, but it is not, not really. Few of the artists whose works reflect the legacy and heritage of the American West were born to the land they portrayed. Frederic Remington was from upstate New York, the son of an emigrant hardware merchant. Charles Schreyvogel was born in New York City and raised in Hoboken, New Jersey, and N.C. Wyeth was a Massachusetts boy. Of the best-known American Masters of Western art, only Charlie Russell could lay claim to an early life on the range. He was from St. Louis, but had ventured to Montana at sixteen to be a cowboy, only to find that his skills as an artist outreached his skills as a cowpuncher, so he hung up his rope and picked up a paintbrush. Clearly, an affinity for the American West is more about attitude, more about the idea of the West, than birthright. Appropriate, when you consider that the American cowboy, like other Americans, came from everywhere. Chengdu, a city of more than ten million, is the capital of Sichuan Province in southwest China. The city calls to mind spicy food (Szechwan cuisine) and giant pandas. 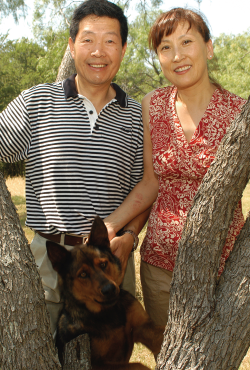 It is unlikely that Russell or Remington ever heard of either, but Xiang Zhang (approximate Texan pronunciation Shüng Zang), whose affinity for the American West rivals theirs, was born there in 1954 into a family of scholars. Zhang’s theatrical aspirations were backstage; he had no desire to be an actor—“I’m too shy”—so he studied set design. “I still wanted to paint, and with set design, I could have four hours of oil painting and drawing each morning,” he said. “In the afternoon, we studied costume design, architecture, the history of theater, set design and drafting.” For the young artist, Beijing was the best of all possible worlds and opportunities. Xiang Zhang entered the Central Academy in 1977 and graduated with a Bachelor of Fine Art in Set Design in 1983. If you have paid attention to the dates in this story, you may be puzzled. Zhang was born in 1954. That would make him eighteen, finishing high school in 1972, but he did not start his studies in Beijing until 1977. The five lost years were swallowed up by China’s Cultural Revolution. Zhang applied to six American graduate schools. All accepted him, but his first choice, Rutgers, had no financial aid for first year students, and Zhang had no money. Of the six, only Tulane offered a full scholarship and a teaching assistant position, so Xiang Zhang packed his bags, boarded an airplane for the first time in his life and headed for New Orleans. When Zhang was in college, he met his future wife, Lily, in line at a bookstore. She learned that he was an artist, and accepted his offer to help her learn to draw. They married in 1982 and have a daughter, Stephanie, who was born a year later. Due to government and economic restrictions, Zhang came to the United States alone. Lily joined him in 1987 and Stephanie in 1990. With the help of James and Dorothy Coleman, important players in New Orleans art circles, Zhang got a job designing Mardi Gras floats. It was better than repairing flats, but it was still working to someone else’s specifications. “You have to do what they want you to do, follow their designs,” he said. The opportunities in New Orleans clearly were limited, so the Zhangs cast their eyes west, toward Texas. “We came to Dallas for a vacation, and Lily found a job as jewelry designer, and I started to look what I could do,” Zhang said. He didn’t have to look far to know what he wanted to do. The theater, the opera, the Mardi Gras floats were fine art, but they were not Fine Art, and Zhang had never given up on going back to his paints and brushes. He got a job as a commercial illustrator. It was a transition, but it was a waste of time. “Most of the time was working on a computer,” he said. “After two years, I quit the job and started painting. Fortunately my painting sold immediately. I was lucky.” Luck may have played a part, but talent carried the day. 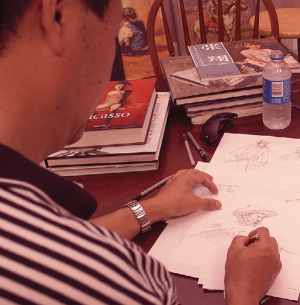 Over the next few years, Zhang did portraits, which won awards, and a series of ballet works, which won awards. Doing what he wanted to do, rather than taking his cue from others, was working out quite well, and then a chance question in a television interview set the artist on a new trail. Xiang Zhang and wife, Lily. If you want to paint a cowboy, you have to find a cowboy, so Zhang headed for the old corral, visiting ranches around Dallas to watch the cowboys at work and to take pictures for reference. “I looked for inspiration and learned about the life and read books about the West.” His first Western painting was entitled “Going Home,” prophetic as the artist from the East was coming home to the American West. He would find a gratifying and rewarding welcome there. Over the past six years, Zhang has earned considerable praise from the art world for his view of the cowboy. As Zhang’s recognition and following are expanding, so too are his canvases. 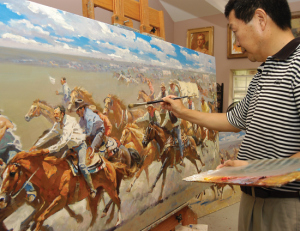 Off a country road west of Sherman, in a studio built along side his house, Zhang is working on two huge canvases depicting the Oklahoma Land Rush. The horses thunder across the prairie, riders leaning forward in the stirrups, straining to see through the dust generated by thousands of animals, men and wagons, as the story of a rush to opportunity unfolds on the canvas. The paintings mark a transition from strictly modern depictions of the West to ones of a decidedly more historical perspective. It is appropriate that a man born to a society long steeped in reverence for the past would find the need and the inspiration to reach back into the history of his new country to chronicle the beginnings of its most iconic symbol, the American cowboy.